All our CV template files are created in Word and PowerPoint and are fully editable. 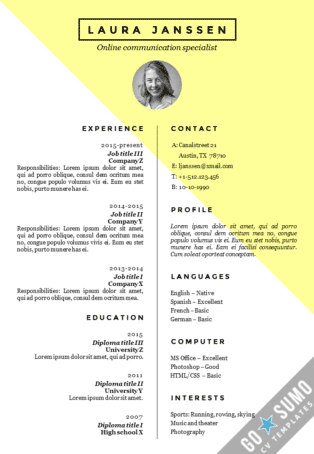 All text and headers on the CV template are overwritable. You can change the color, fonts, letter size etc. All files are open documents. You can save them directly on your own computer, edit and save them as often as you like. 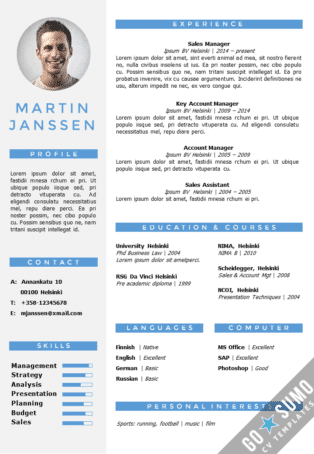 You can customize the layout and add extra pages to the CV template if you like. Some of our CV template packages come with two different pre-set color versions included. But if you like to change the colors you can change them to any color you like. The headers in the CV templates are written in English as an example. 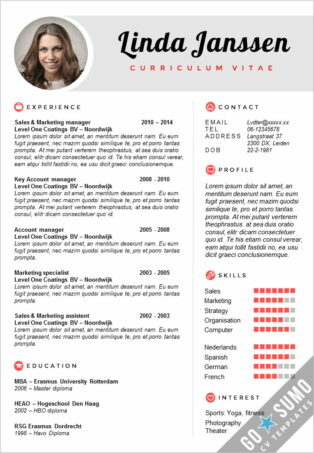 You can overwrite all the text and headers in the CV template and rewrite to any language you prefer. Within the CV template package you will find an instructions document with tips and instructions on how to edit the CV template. 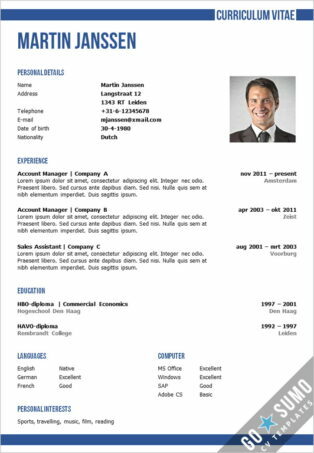 If you have a question about the editing of the CV template, you can always contact us, we are more than happy to help you. 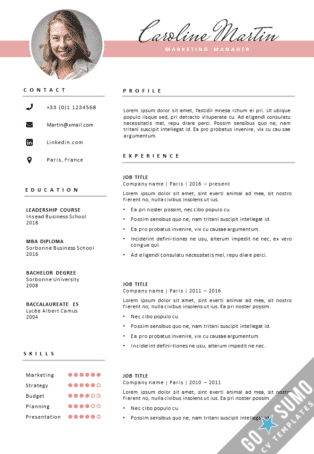 Within the CV template package you will find the CV template in word and PowerPoint. You can choose which program you prefer to work in. 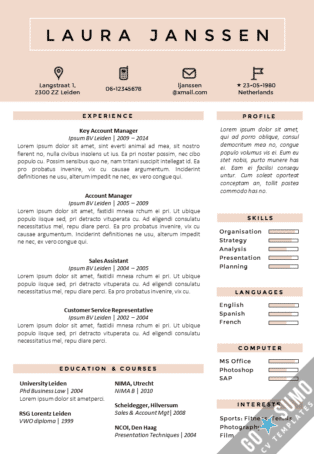 It is not very common to send a CV to a recruiter as a PowerPoint file, but we recommend to save the final version of your CV template (edited in Word or in PowerPoint) as a PDF file. Therefore you are free to choose to edit the program you prefer. With a PDF CV document you will be absolutely sure that the person that receives your CV will see the document exactly the same as how you see it on your computer. 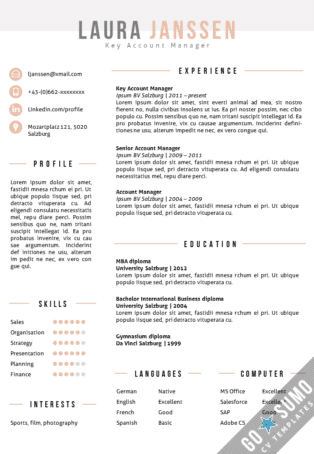 When you are familiar with Word and PowerPoint, it is a bit easier to edit the CV template in PowerPoint. It is easier to add and edit pictures in PowerPoint. In PowerPoint it is also easier to shift with the sections on your CV template. 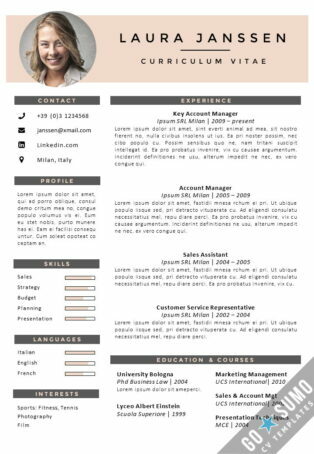 When you want to make a lot of changes to the design of the CV template lay-out, we recommend to work in PowerPoint. You can download the CV files immediately after completing your purchase. You will receive a download link in your mailbox and you will see a download link on the return page after completing the payment. You can download, save and edit the files directly on your own computer. 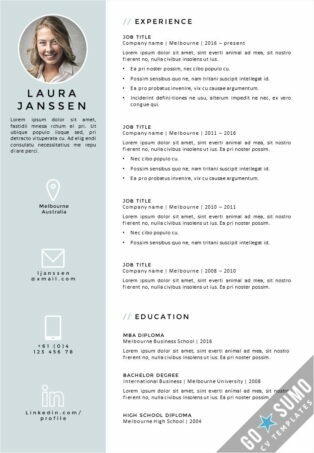 You don’t have to edit and save the CV template online. If you order a CV template it is a one-time purchase, there is no subscription needed. 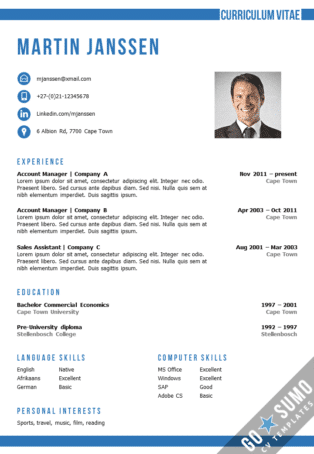 Just order and you will receive the fully editable CV template files immediately. When you purchase a CV template, you will get both A4 Paper size and in US Letter paper size files. These are the two most common paper size settings. 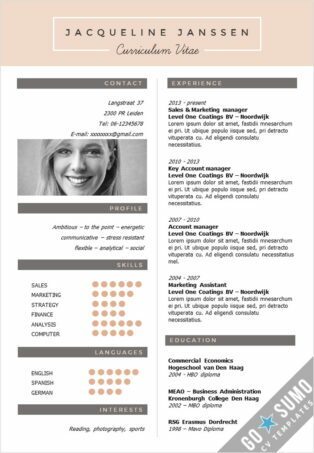 Switching paper size in a CV template document you are already working in can cause lines or textboxes on the CV template to skip. Therefore it is important to decide which paper size setting you want to use before you start editing your CV. Outstanding design with a professional appearance. 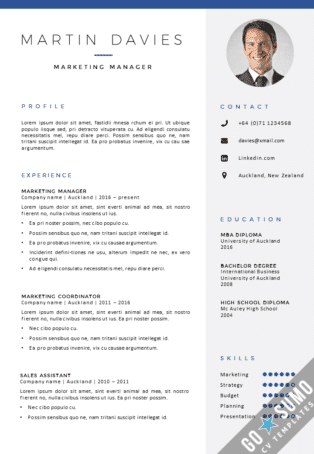 We have designed many different CV templates. Some of the templates are very colorful and creative and some have a formal design. If you are wondering which of the templates to choose, read our blog post about that topic here. 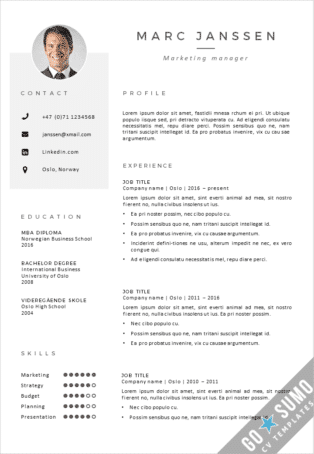 We always keep the purpose of the document in mind when we design a CV template, applying for a job is a serious task. Standing out from other candidates is only a good thing when you do so in a positive way, without losing your professional appearance and without wasting the time of the recruiter. 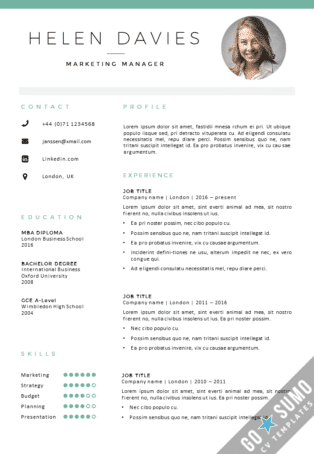 In the CV template design we keep all sections clearly separated from each other, this will keep the CV easy to read and, even more important, easy to scan quickly. Recruiter often make a first selection based on just a quick scan of the CV’s. You don’t want your CV to be a source of frustration for recruiters by having a design that makes it hard to have a quick overview of the content. Each CV package contains matching cover letter template documents. Just as the CV documents, you will get a Word and a PowerPoint version. Both in A4 paper size and US Letter paper size lay-out. The cover letter templates are specifically designed to service as writing paper, with a lot of space reserved for body text. 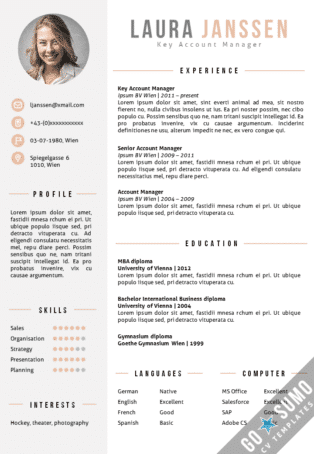 The cover letter templates have several design aspects that match the design of the CV. When you send out your job application documents, it will be easy to recognise and pair them by design and it will give your job application an professional presentation. To work with our CV template you need a computer with MS Office (version 2007 or a more recent version) installed. This can be a PC or a Mac, as long as you have MS Office installed on it. We don’t recommend to work with the template files on a mobile device. When editing the document it is best to have a mouse or a good touch pad to work with. Although the editing of the files does not require very special skills, it is important to have basic knowledge and experience with MS Office, Word or PowerPoint. 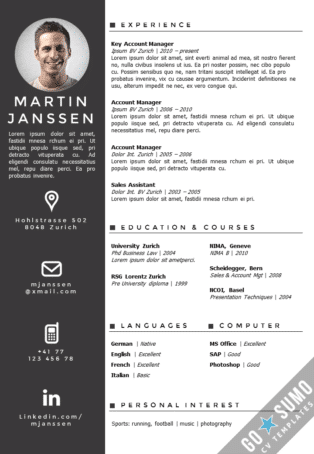 Some of our CV template require the installation of extra fonts. In the package you will get a download link to download and install these fonts and in the instruction document you will find instruction on how to install the extra fonts quickly. We try to keep the number of additional fonts as low as possible. But the fonts are important for the overall design of the CV and cover letter. You can also replace the fonts by other more common fonts that are available within MS Office. Try to select a replacement font with a similar size to avoid text lines to skip. If you have any questions about our products or about the editing of our template, you can always contact us. We are more than happy to help you as quick as possible. We also have set up a list of frequently asked questions. If you cannot find an answer to your question, don’t hesitate to contact us. You can reach us through our contact page here. The CV is often the first document a recruiter will look at. And often this first quick look is enough to make a first selection. Although the content of your CV is the main reason for selection or rejection, the appearance of your CV document can influence this decision. If you have a very messy CV layout that is full of little mistakes, a recruiter will think you are a sloppy person that did not really care to put an effort into your job application. We have asked a lot of recruiters about what look for in a job application. Most recruiters really appreciate it when it shows that candidates have taken the effort to present themselves the best way they can. This can be seen in the content of your CV and cover letter, by customizing your document for each job application. But also the overall appearance of your documents is a good indicator of your effort to make a good impression for the job application. Especially when there are a dozens of other candidates with a similar background and experience, little details can make a big difference. In large parts of the world the only term used is CV, or Curriculum Vitae. In the United States also the term resume is used. In the United States the CV is a documents used more by academics, scientific researchers, medical specialists etc. It is a complete and detailed overview of all the professional and educational information of a person. Whereas the resume is a shorter document that contains only the information relevant for the specific job application. The resume is more focused on competencies. 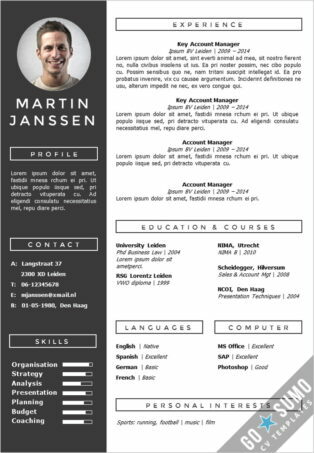 The Curriculum Vitae will have multiple pages, but for a resume it is best to keep the document on a single page, at max maybe two pages. In the other parts of the world a resume type documents is called CV or curriculum vitae. A European scientist will have a long and detailed CV while a sales person in Europe will have a CV that is shorter and focused on competencies, just like the resume in the United States. Read more about the differences between a resume and a curriculum vitae here. In our CV templates you will find sufficient space reserved for these three basic elements. There are also other elements that you can add to your CV, depending on whether the information is relevant for your job application. On most of our cv lay-outs we have created space for other elements like for example; personal profile, skills, language skills, computer skills, personal interests, achievements, awards, extracurricular activities. You can use these sections if they are relevant for your job application. You can also delete or change the sections into other elements if you want. The personal profile can be an important element to add to your CV. 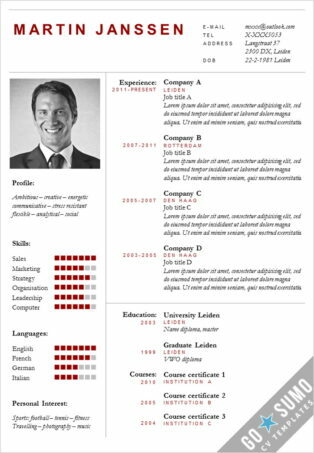 Since a lot of recruiters make a first selection based on just a quick look at the CV’s, a personal profile give you the opportunity to summarize your information and add information about your personality to your CV. When you are writing your CV it is best to use a reverse chronological order. Start with the latest job and make your way back to your first job. As soon as you have some relevant work experience you should place your work history above your education on your CV. Only when you are fresh out of school you should start with your education and write about your student jobs and extracurricular activities below. Try to keep the sentences on your CV short and easy to read. Avoid using “I”, “my” or “me” in your sentences. Don’t write; “I am a financial controller with a lot of experience”, instead write; “Experienced financial controller”. Don’t write large paragraphs of text on your CV. Try to use bullet points to sum up your tasks and responsibilities. When you are adding information besides the basic information about your work history, education and contact information, question yourself whether the information is really relevant for the job you are applying to. Adding information about your personal life (like hobbies) can be useful to give the recruiter an idea of your personality. This can be important when certain personality traits are important for a job. But be careful not to become too personal or informal on your CV, keep it relevant and keep it professional. Tweak your CV for each job application. Every company is unique, and therefore every job application should be unique. Within the job description of the vacancy you are applying to, you will find specific keywords. Use these keywords in your CV and cover letter. GoSumo is part of De Leydsche based in the Netherlands. 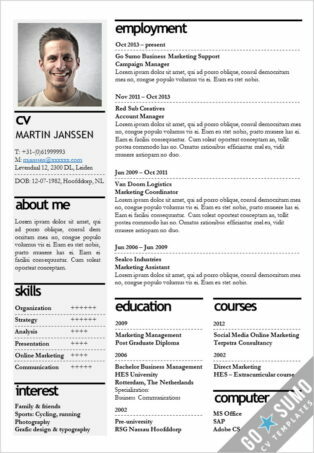 We have been designing CV templates and rewriting CV’s (in the Netherlands) for more than 5 years. We regularly have contact with hiring managers and recruiters to ask their opinion about CV’s. We always try to apply their tips in our design as much as we can. We also have a lot of contact with job seekers who try to improve their job applications. We know that applying for a job can stressful and sometimes demotivating. A large part of applying to a job is advertising and selling yourself to the hiring manager or recruiter. We believe it is important to keep working to improve the way you present yourself. A stylish CV with a matching cover letter can help you improve the way you present yourself. We hope our CV template will have a positive impact on your job hunt. We wish you great success with your job application! You can read more about GoSumo on our About page.